A compassion of the fit of both pullovers. Sorry for the bad picture quality on the left, that was my phone camera. 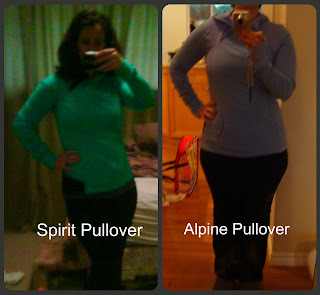 Both Pullovers are a size 8 and are pretty close in fit. The only difference I find is that the Alpine Pullover is a bit more comfortable around the neck opening. I found my Spirit Pullover pulled slightly towards the opening. 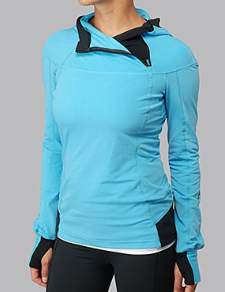 The Spirit Pullover has a different hem around the bottom with the black detail and cute reflective designs. The seam detail along the front is pretty similar. "Run: Post Pullover is Here"